Algeria’s state news service says about 60 foreign hostages are unaccounted for in the standoff with Islamist militants now entering its third day. The news service said more than half the 132 foreign hostages had been freed, but the report could not account for the rest. The report Friday also said special forces had resumed negotiations after an assault Thursday at the gas plant deep in the Sahara. A Mauritanian news site that frequently receives messages from al-Qaida linked militants said the hostage-takers in Algeria had offered to trade two captive Americans for two jailed terror figures in the United States. One of the two, Omar Abdel Rahman, masterminded the 1993 World Trade Center bombing. A deadly Algerian military raid to free hostages from at least 10 countries and wipe out their Islamist militant captors moved closer to the heart of the natural gas complex on Friday, the government news service said. A total of 18 militants were killed and the plant’s living quarters were secured, according to the news agency, which cited security officials. Dozens of energy workers remained unaccounted for after the Algerian military’s initial claim that the assault at the remote desert facility was over late Thursday. Algeria’s government has kept a tight grip on information, but it was clear that the militant assault that began Wednesday has killed at least six people from the factory — and perhaps many more. Workers kidnapped by the militants came from around the world — Americans, Britons, French, Norwegians, Romanians, Malaysians, Japanese, Algerians. Leaders on Friday expressed strong concerns about how Algeria was handing the situation and its apparent reluctance to communicate. 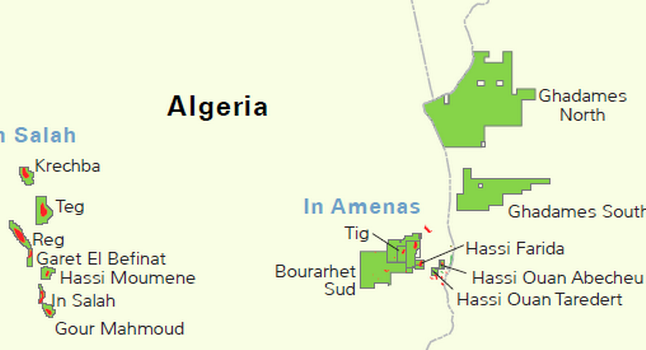 Terrorized hostages from Ireland and Norway trickled out of the Ain Amenas plant, 800 miles (1,300 kilometers) south of Algiers, the capital. BP, which jointly operates the plant, said it had begun to evacuate employees from Algeria. Algeria’s army-dominated government, hardened by decades of fighting Islamist militants, shrugged aside foreign offers of help and drove ahead alone. On Friday, Algeria’s ambassador to Japan was summoned and told that Japan demanded that Algeria prioritize hostages’ lives and cooperate more closely. The U.S. government sent an unmanned surveillance drone to the BP-operated site, near the border with Libya, but it could do little more than watch Thursday’s military intervention. British intelligence and security officials were on the ground in Algeria’s capital but were not at the installation, said a British official who spoke on condition of anonymity because he was not authorized to speak to reporters. A U.S. official said while some Americans escaped, other Americans were either still held or unaccounted for. Defense Secretary Leon Panetta was briefed early Friday, according to a senior defense official, who offered no other details because “we view it as a sensitive, ongoing situation.” The officials spoke on condition of anonymity because they authorized to discuss the matter publicly. Militants claimed 35 hostages died when the military helicopters opened fire as they were transporting hostages from the living quarters to the main factory area where other workers were being held. The group _ led by a Mali-based al-Qaida offshoot known as the Masked Brigade — suffered losses in Thursday’s military assault — but garnered a global audience. The remote location is extremely hard to reach and was surrounded by Algerian security forces — who, like the militants, are inclined to advertise their successes and minimize their failures. The official news agency said four hostages were killed in Thursday’s operation, two Britons and two Filipinos. Two others, a Briton and an Algerian, died Wednesday in the initial militant ambush on a bus ferrying foreign workers to an airport. Citing hospital officials, the APS news agency said six Algerians and seven foreigners were injured. A spokesman for the Masked Brigade told the Nouakchott Information Agency in Mauritania that only seven hostages survived. At least one Filipino managed to escape and was slightly injured. The militants made it clear that their attack was in revenge for the French intervention against Islamists who have taken over large parts of neighboring Mali. France has encountered fierce resistance from the extremist groups in Mali and failed to persuade many Western allies to join in the actual combat.